A fantastic desk at a fantastic price point, the LUXOR Standup-CF48-DW Stand Up Desk is sturdy, eye catching, easy to use and doesn't break the bank. While the crank system may be frustrating for some, it gets the job done and it does it well. Over the past couple weeks, we’ve taken a close look at the best desktop standing desks on the market. Desktop standing desks provide a simple way to get into the standing desk market without breaking the bank by adapting your existing sitting desk into a sit/stand desk. They’re simple, easy to set up, and easy to use. In contrast, a dedicated standing desk replaces your existing sitting desk. Typically they have some mechanism to raise and lower the entire desk, which is usually either a motorized device or a crank shaft. So with all the advantages of a desktop option, why would anyone consider purchasing a dedicated sit/stand desk? Well, dedicated standing desks tend to be sturdier and also typically provide a larger workspace. In addition, some folks just prefer a more permanent solution or find dedicated standing desks to be more aesthetically pleasing. Many dedicated standing desks look like a regular desk, and can even be purchased with real wood tops that would be right and home in an executive board room. Today we’re taking a look at the LUXOR Standup-CF48-DW stand up desk. The LUXOR desk is designed to be a dedicated standing desk that still retains many of the benefits of a desktop standing desk. As a dedicated standing desk, it can be used by itself when you are both sitting and standing. 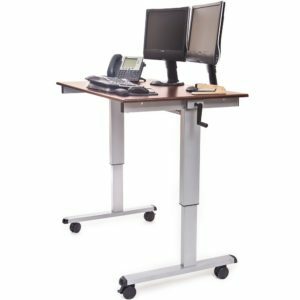 However, the LUXOR desk also has casters, which allow you to move it around the office nearly as easily as a desktop sit/stand desk. The fit and finish of the LUXOR is top notch and gives a professional appearance that would be at home in any sort of office setting. It is constructed from high quality powder coated steel which provides the sturdiness that you need in a standing desk, but still blends in when in the office. The LUXOR has a height range of 29″ to 42.5″ inches. The desktop itself has a realistic dark walnut finish, and though somewhat thin at about 3/4 of an inch, is plenty sturdy for nearly anything you can throw at it. In fact, the LUXOR illustrates what is, in my opinion, the primary advantage of a dedicated sit/stand desk — load capacity. Whereas the desktop sit/stand options tend to support loads in the range 25 to 50 pounds, the LUXOR can handle up to 75 pounds! In addition it is available both 48″ and 60″ inch wide models, which provides plenty of usable desk space for nearly anything you might want to put on it. The LUXOR does have a few downsides. As one might expect with a desk this size, it does not come pre-assembled. In addition, the assembly instructions leave something to be desired, which means that putting the darn thing together might take some time for those who aren’t mechanically inclined. In addition, when fully extended, the desk does have some play, though not any more than most standing desks I have encountered. One thing to keep in mind is that the LUXOR uses a crank rather than motors to raise and lower the desk. The crank system works great, but it involves some elbow grease to raise or lower, 88 cranks from fully retracted to fully extended to be exact. You can think of it as a bonus if you’d like — a standing desk AND an arm workout in one! However, for folks with limited mobility, the crank may be a problem. Sturdy Frame – Powder coated steel frame. Mobile – 3″ casters allow you to move the desk as you see fit. Price – Price point is reasonable/affordable for an entry level dedicated standing desk. Crank System to Raise and Lower – Can be a pain to raise or lower. The LUXOR Standup-CF48-DW standing desk is a fantastic entry level desk for those looking to fully dive in to the standing desk movement. It is built from quality materials that will last a lifetime, but doesn’t break the bank. While the crank system may not be ideal for some, it gets the job done and potentially decreases the weak points that might wear down over time versus an electronic motor approach. Final Verdict: If you’re looking for a sturdy, affordable way to get into the world of standing desks, this is the product for you.